RETURN TIME: We will arrive at Foster Bar approximately 3:00 PM. For guests that wish to explore the coast, arrangements can be made with Morrison's Lodge to have your vehicle shuttled to Foster Bar. ROW provides shuttle service for guests returning to Morrison's lodge where guests can plan to arrive back to Morrison's Lodge om Merlin Oregon approximately 5:00 - 5:30 PM PST. AGE LIMIT: Minimum age is 12 * NOTE: Our hiking trips are raft supported therefore you can choose to float or hike. If you are choosing to float full time the minimum age is 7. BOAT TYPE: Oar raft, paddle boat and inflatable kayak upon request. TRIP DATES: Lodge based trips on Saturdays and Sundays in late May - early June as well as camping dates in September and October. 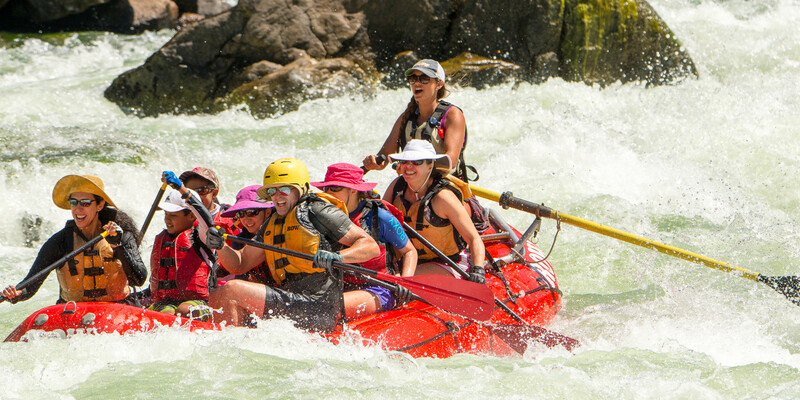 TRIP INCLUDES: Services of our talented adventure consultants and professional guides, all meals/beverages as indicated in the itinerary, transportation to/from river from Morrison's Lodge in Merlin Oregon. DOES NOT INCLUDE: Airfare/transportation beginning and ending points, shuttling your car from Merlin, Oregon to Foster Bar take out (near Gold Beach Oregon) optional, gratuities, travel protection plan, pre-& post-trip hotel, items of a personal nature. Travel to Merlin, Oregon and meet your Team Leader at Morrison's Lodge at 5:45 pm for a one-hour orientation meeting to answer last minute questions. You will receive your waterproof gear bags (one for every two people) to pack. Dinner is on your own. On the ﬁrst day of your hiking adventure, we greet you at 7:45 am at Morrison's Lodge. Anyone who drove their own vehicle to Merlin can park their cars at Morrison's Lodge in a secure area during the hiking trip. Hikers then step into a lodge van and are transported to Grave Creek - the starting point for the hike and for our support rafts. The ﬁrst day’s hike is 9.6 miles to Black Bar Lodge. The Whisky Creek miner’s cabin is a usual interpretive stop; our guides are natural storytellers and will make your trip more rewarding with their stories about this and other sites. We stop for a riverside buffet lunch along the way, often near the Tyee Rapids campsite. In the spring there are also dozens of wildﬂowers in bloom in the Rogue River canyon and viewing them is fascinating. After lunch, we continue along the trail to Black Bar Lodge. The trail to the lodge ends at the river’s edge, where one of the guides will ferry you in a raft across the river to the lodge. After the lodge staff help identifies your cabin, there is some time to freshen up. Our guides prepare the evening’s hors-d'oeuvres, complemented by Oregon wines and beers as well as other beverages. Lodge staff serves dinners family-style on long tables at around 7:00. After dinner, you can play cards, visit, play the lodge guitar or stroll around the grounds and then turn in at your leisure. At 10:00 pm the Black Bar Lodge's generator is shut down, so we encourage you to bring ﬂashlights since the property can get very dark. This makes for great star gazing and a peaceful, quiet sleep. In the morning, Black Bar Lodge serves a country breakfast around 7:30 am. After that, there’s time to pack up before walking back to the river and ferrying back to the trail. Today’s hike covers a little less than 15 miles on a gentle trail. On day two there will be more stops on the Rogue River trail at historic sites and pauses for beautiful vistas of the river. After working up a good appetite, we serve a bountiful riverside lunch, usually at a place called Winkle Bar - the site of western novel writer Zane Grey’s river cabin. Refreshed and re-energized, we continue hiking downriver to Marial Lodge, arriving late afternoon. Again, rooms are assigned, there’s time for a shower and relaxing and then hors-d'oeuvres are served. Dinner is served around the unique round ‘double lazy susan’ tables of Marial Lodge. After dinner, we offer a short hike to enjoy the soft summer light and spectacular views of the river canyon as well as other activities around the lodge. The evening is a good time for wildlife viewing as well. The power generator is never turned off at this lodge so there is power available all night. Wake up to a gentle knock on the door from our lodge host for 8:00 am breakfast. It’s a casual pace though, as the hike to Paradise Lodge is just under four miles. Since this is such a short hiking day, anyone who wants will head back upriver to the beautiful grounds of the Rogue River Ranch, which is a museum and interpretive center. After the visit, and imagining what pioneer life in the canyon must have been like, we head back downstream - stopping for lunch back at Marial Lodge. Hiking through Mule Creek Canyon and past Blossom Bar rapid provide spectacular viewing along the way to Paradise Lodge where we arrive by mid-afternoon, so there’s plenty of time to enjoy the expansive lawn and maybe have a game of Frisbee or sit and watch the river go by. As the afternoon sunsets, hors-d'oeuvres are served along with the usual selection of beverages. Then it’s a nice dinner and time to sit on the deck and watch the stars and share stories of the day. We wake up a bit earlier today around 7:00 am, enjoy a leisurely breakfast and then get back on the Rogue River hiking trail. About 7.6 miles down-trail we reach Flora Dell falls and have lunch. The river canyon has widened here and on a hot day, you might enjoy a dip in the river. After lunch, we all climb aboard our rafts to be transported to the take-out point, Foster Bar. We arrive by early afternoon and then load up into vans to return to Morrison's Lodge. The drive takes about two hours on a winding and scenic road through the mountains. You will be back to Morrison’s Lodge around 5:00 to 5:30 pm. The Wild and Scenic section of the Rogue River is located in Southwest Oregon 20 miles northwest of the city of Grants Pass. The nearest airline service is located in the city of Medford about 50 miles from our Rogue River launch point in Merlin, Oregon. Interstate 5 is the main highway into the area. Camping is available near Galice at Indian Mary Campground and at Alameda Bar. Reservations are needed during the summer and can be made through the Park Service: (541) 474-5285. Meeting Time: We recommend that guests arrive in the area the night before launch day. We will meet you at Morrison’s Lodge near Merlin, Oregon at 5:45 pm the evening prior to your departure date for a one-hour orientation meeting to answer last minute questions and give you your waterproof bags to pack. This is an important meeting, so please be on time. The next morning, we will meet you around 7:45 am at Morrison’s and transport you to the launch point for your trip. Please have breakfast on your own before we meet. The return trip to Morrison’s includes a scenic 2-hour van shuttle (this shuttle is included in your trip fees) back over the mountains, which arrives at approximately 5 pm. If You Drive: From I-5 (north or south) take Exit 61 to Merlin. Merlin is 3 miles west of I-5. Turn left (west) onto Merlin-Galice Road and go 12 1⁄2 miles. You will cross a large, yellow bridge over the Rogue River about two miles before you reach Morrison's Lodge, which will be on your right. If You Fly: The nearest airport is located in Medford, Oregon – the Rogue Valley International Medford Airport – which is approximately 28 miles south of Grants Pass. United, United Express, Horizon/Alaska and Delta Connection service this airport. Shuttle service can be arranged from the airport to your accommodations in Grants Pass or Merlin. This shuttle can also pick you up at Morrison’s the afternoon you return from the river and return you to the airport or, to your accommodations if your ﬂight is not until the following day. For assistance with shuttle service, call Morrison’s Lodge (800) 826-1963 or Galice Resort (541) 476-3818. Please note: The fees that these shuttle companies charge are in addition to your trip fees. Private aircraft can ﬂy into Grants Pass, Oregon Airport-FAA identiﬁer, 3S8. The airport is 5 miles from Grants Pass and about 20 minutes from our meeting point at Morrison’s Lodge. We highly recommend checking the weather prior to your trip for an updated forecast and current conditions. We recommend the following websites. Weather in any river canyon can vary widely day to day. However, the Rogue’s typical daytime temperatures can climb into the 80’s & 90’s, with the water temperature generally 60-70 degrees. Early and late season trips can also have temperatures ranging from 60-80. While blue skies & sunshine are predominant, rain can happen any time so please bring rain gear! Weather in the northwest is unpredictable. You must come prepared for cold/wet weather and hot/sunny weather – sometimes even on the same day! The following information will help you be prepared for the expected as well as the unexpected events of your trip. You may not use all of the gear listed below, but we recommend bringing it all! One large waterproof bag for each person (13” in diameter x 24” tall when closed) This bag will contain the majority your personal items. This bag is NOT accessible during the day. One small waterproof day bag for each person (9" in diameter x 20" tall) This bag is for items you want to access during the day such as rain gear, sunscreen, camera, medications, etc. If you are on our CAMPING trip: We will provide each guest with a sleeping bag, pad, and liner. We also supply tents (double occupancy), tables, chairs, etc. If you are on our LODGE trip: Your cabin/room has beds and showers…you don’t need to bring bedding or towels, but you will need to bring your own shampoo. River attire is very casual – comfort and convenience take precedence over style! 1 pair of river shoes or sandals or sneakers that can get wet (must have an ankle strap, no flip-flops!) Velcro is okay if in good condition. Popular name brands include Chaco, Teva, Keen or Merrell. Tennis shoes with wool or synthetic socks are a good option if your feet tend to get cold. 1 synthetic fleece or wool mid-weight sweater for layering on cool days. Mid-weight to light-weight long synthetic underwear tops and bottoms. Best worn over a swimsuit and undershorts. River shoes – a pair of sandals like Chaco, Teva, etc. that you do not mind getting wet. All hiking guests need to be prepared to raft. Hikers are welcome to get into, or out of a raft at lunch or other points along the trail that provide river access if they are tired, injured or just want more or less river time. It is required to get into a raft to cross the river at Black Bar Lodge and to float out the last section of the trip. Camera – waterproof digital with extra batteries & memory card is recommended. Many guests use smartphones (there is NOT cell service on the river). A waterproof case is also highly recommended for protection and ease of use. Bee sting kit for those allergic to bees. Cards, Games, Books, Musical instruments, journal, etc. *** Since the lodges use generators for electricity, please no hair dryers or curling irons. LAYER #1: The layer next to your skin should be close-fitting and thin. A snug-fitting underwear or mid-weight fleece layer made of synthetic fibers work best. You do not want to wear cotton on the river on cool rainy days. The evaporation of water from a wet cotton layer will actually make you colder! Synthetic fibers maintain insulative properties when wet and "wick" moisture away from your skin. If you plan to fish, please bring your own fishing gear (with a protective case), as we do not have any to loan. Oregon fishing licenses are required if you plan on fishing. Fishing on the Rogue is best in the fall. You can pre-purchase a license online at https://or.outdoorcentral.us/or/license or by calling (503) 947-6101. ROW packs moderate quantity of soft drinks as well as wine and beer for legal age guests. If you bring your own liquor or other personal favorite beverages, please give it to your guide in its original container. Beer should be in cans - No glass beer bottles please. Bottled wine is fine. Liquor in Oregon is sold in State Liquor Stores with limited hours. It may be easiest to purchase your liquor or other favorite beverages at home or on the way to the river trip, rather than after the pre-trip meeting at Morrison's Lodge.